“Every stone that I use—be it Fordite or a natural gemstone—is selected because something about its color speaks to me at a deep, gut level. It could be one color or a combination of colors. All I know is that my jewelry is all about color” explains Tamra, and this is visible in every design. Her latest ‘hook’ is Fordite, the result of the build-up of layers of auto enamel overspary in the painting bays used in factory auto painting processes back in the 1970s. Each vehicle was painted in an enclosed bay where excess paint accumulated on surrounding fixtures and was cured hundreds of times over. Later it was discovered that the material could be cut and even faceted like traditional gemstones, and proceeded to harvest the layered paint chunks from the old fixtures (hoarding their finds) before new painting processes were put into place. It is now a very efficient process and there is no more excess paint to be had. Now resources are limited, making Tamra’s work even more desirable. Tamra was recently featured in the February/March 2011 issue of Desert Gold Magazine. She continues to evolve and is always open for new inspiration, as long as it ‘speaks’ to her we will enjoy seeing or having and wearing one of her pieces. 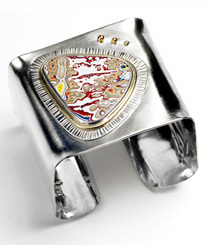 The work of Tamra Gentry is the union of fine metalsmithing with the creativity of Fordite and beautiful gemstones. Experience it all in the online contemporary artisan jewelry store MOCAShop.com! ← MOCAShop.com a finalist at 3rd Annual International Business Leadership Awards presented by the Greater Miami Chamber of Commerce! You’ve made some decent points there. I checked on the internet to learn more about the issue and found most people will go along with your views on this site.